Good luck finding many notes like this. Currently only two are known to exist. High denominations like this rarely show up any more these days. 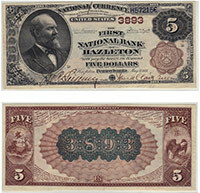 This will always be a rare national bank note. The value of any territorial is just based on its condition and the bank that printed it. Please contact us if you have questions regarding the value of your note. Don't forget to check the serial number. Number 1 notes always sell for nice premiums.